or call 1 877-OASISMT for the latest information. You don’t have to live out in the boonies to use solar power! The exciting line of Sunny Boy grid-tie inverters from SMA makes it easy for the majority of us that are connected to the utility grid to use the clean energy from the sun. Founded in Germany in 1981 as an engineering/control systems company, SMA started producing the Sunny Boy line of inverters in 1996. These inverters allow you to install a photovoltaic system without having to worry about purchasing an expensive, heavy battery bank. The DC power that is produced by the solar array is inverted to AC by the Sunny Boy inverter, after which it is either used by your AC appliances or sold back to the utility grid to lower your monthly utility bill. The Sunny Boy units are called "string" inverters because they are designed to be wired to a single series string of 12-24 solar modules. This makes the solar array wiring very easy since you don’t have to worry about paralleling multiple strings of solar modules together in a combiner box. However, the high DC voltage that this series string of solar modules produces needs to be handled very carefully because it can be lethal! To minimize the potential shock hazard of this system’s high DC voltage, the solar array wiring should be done with all of the solar modules lying flat on the ground or roof, after which the entire array can be lifted or tilted into place. If that is not possible, be sure to completely and securely cover each and every solar module with a heavy opaque material (blanket, cardboard, tarp, etc.) before wiring the array. A professional installer is recommended for those not familiar with these systems. SMA inverters are available in sizes from 3000 to 7000 watts, making them ideal for a wide range of applications from small residential to very large 3-phase industrial systems. All SMA inverters come standard with built-in LCD digital monitors that display instantaneous power output, energy delivered during the current day, and the total energy produced since installation. The SB3000 and SB4000 are auto-sensing for 208 or 240 Vac applications. The SB 5000, 6000, and 7000 can be field configured for use in 208, 240, and 277 Vac applications. The SB 3000 through 7000 come with a DC disconnect switch with an integrated 4-input, fused-series string combiner. The DC disconnect connects to the bottom of the inverter for easy installation of service. The SB 3000 through 7000 are field configurable for positive ground arrays. Indoor/ outdoor NEMA 3R Enclosure, powder-coated aluminum (convection with regulated fan cooling). All sensitive electronic components are in a sealed compartment to ensure long life in harsh environments. and are certified to the new UL-1741/IEEE 1547 standards. Weight / Shipping Weight 84 lbs / 97 lbs ?? 88 lbs / 94 lbs ?? For other Sunny Boy products, check out their web site- www.SMA-AMERICA.com. 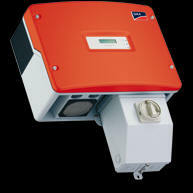 And for the NEW SMA Sunny Boy batteryless, transformerless, grid-tie inverter, click here.